The International Handel Recording Prize is awarded by a specially chosen panel of respected scholars and journalists who each possess a special and informed interest in Handel's music. This year we are delighted to congratulate Alan Curtis, Il Complesso Barocco, and Virgin Classics upon the award of first prize for its recording of Handel's final opera Deidamia. We congratulate the excellent cast of singers, music director, and record label for producing such a distinguished and exemplary recording of an unfairly neglected opera. 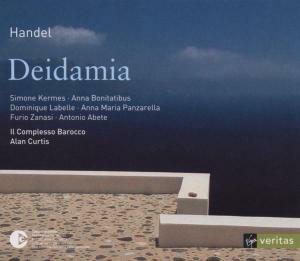 Despite being Handel's last Italian opera composed for London before he turned his full attention to English oratorios, Deidamia shows that Handel was still at the peak of his powers. Alan Curtis's recording reveals the subtlety in Handel's musical characterisations of Ulisse (brilliantly sung by Anna Bonitatibus) and Deidamia (a stunning and emotional performance by Simone Kermes). Il Complesso Barocco demonstrate that the score has many beauties that were almost entirely unfamiliar to even the most dedicated Handel lovers. Prior to this recording there was only one inadequate version of Deidamia that did little more than fill a gap in the catalogue. Alan Curtis's performance does much more than that. In terms of artistic quality, performance standards, and packaging, this Virgin Classics recording is one of the most consistently satisfying Handel opera recordings yet made. We also wish to commend this year's runner-up. We could not ignore the vibrant and affectionate performance of Handel's Neapolitan serenata Aci, Galatea e Polifemo by Emmanuelle Haïm and Le Concert d’Astrée (Virgin Classics 5455802). (Read the review.) It came second to Alan Curtis's Deidamia by only the narrowest margin, and in another year might have comfortably won the first prize. The annual International Handel Recording Prize is awarded to one distinctive new recording of Handel's music. The winner is carefully selected from a comprehensive list of all new recordings of Handel's music released during the previous calendar. The winner must satisfy tough criteria: it needs to combine fine interpretive quality with a penetrating or valuable insight into Handel's genius. Thus this Prize is an indication of a disc's quality and its contribution to Handelian knowledge. The panel of judges constitutes respected Handel musicologists and journalists who can discern those recordings of Handel's music that make valuable contributions to the discography. The International Handel Recording Prize has unparalleled integrity. Unlike such prizes awarded solely by scholars, or only by critics, our panel comfortably blends those commonly opposed perspectives. Furthermore, this is not a financial prize, but purely idealistic: this prize is an indication of a genuinely special recording, and is designed to encourage unique and supportive recognition from a cross-section of those who care most about the music itself. Simone Kermes (soprano), Anna Maria Panzarella (soprano), Dominique Labelle (soprano), Anna Bonatatibus (mezzo-soprano), Antonio Abete (bass), Furio Zanasi (bass); Il Complesso Barocco; Alan Curtis. Virgin Veritas. Marijana Mijanovic (mezzo-soprano); Magdalena Kozená (soprano); Anne Sofie von Otter (mezzo-soprano); Charlotte Hellekant (alto); Bejun Mehta (countertenor); Alan Ewing (bass); Orchestre et Choeurs des Musiciens du Louvre-Grenoble; Marc Minkowski. DG Archiv. Vasiljka Jezovsek (soprano); Dorothee Mields (soprano); Annette Markert (alto); James Gilchrist (tenor); Christian Immler (bass); D'Arcy Bleiker (bass); NDR-Chor; Dresdner Barockorchester; Hans-Christophe Rademann. NDR Klassik Club. Alison Smart (soprano); William Towers (countertenor); Michael Hart-Davis (tenor); Gavin Carr (baritone); Saint Michael’s Singers; English Symphony Orchestra; William Boughton. Nimbus. Siri Karoline Thornhill (soprano); Martin Wölfel (countertenor); Jan Kobow (tenor); Kay Stiefermann (bass); Knabenchoir Hannover; Barockorchester L’Arco; Jörg Breiding. Ars Musici. Vivica Genaux (mezzo-soprano), Miah Persson (soprano), Inga Kalna (soprano), Lawrence Zazzo (countertenor), Christophe Dumaux (countertenor), James Rutherford (bass), Dominique Visse (countertenor); Freiburger Barockorchester; René Jacobs. Harmonia mundi. Stephen Varcoe (bass), Michael Chance (countertenor), Nancy Argenta (soprano), Laurie Reviol (soprano), Mark LeBrocq (tenor); Maulbronner Kammerchor; Hannoversche Hofkapelle; Jürgen Budday. K&K. Sophie Daneman (soprano), Daniel Taylor (countertenor); Juliette Galstian (mezzo-soprano); Richard Croft (tenor); Nathan Berg (bass); Les Arts Florissants; William Christie. Erato. Piau (soprano), Mingardo (alto). Le Concert d'Astrée, Emmanuelle Haïm. Virgin Veritas. Suzie LeBlanc (soprano), Mark Bleeke (tenor); Marc Molomot (tenor); Nathaniel Watson (bass); Les Boréades, Eric Milnes. ATMA Classique. Kermes (soprano), Beaumont (alto). Il Complesso Barocco, Alan Curtis. Deutsche Harmonia Mundi. Nancy Argenta (soprano); Maria-Cristina Kiehr (soprano), Marcel Reijans (tenor), Klaus Mertens (bass); Il Combattimento Consort; Willem de Vriend; Challenge Classics. Lynne Dawson (soprano). Lautten Compagney, Wolfgang Katschner. Berlin Classics. Wolfgang Glüxam (harpsichord), Gradus ad Parnassum Wien, Hiro Kurosaki. ORF. Dresden manuscript arrangements of Il Pastor Fido overture (HWV 8a), Sonata in F (HWV 392), Radamisto overture (HWV 12), Sinfonia from Saul, Op.3 no.1. Batzdorfer Hofkapelle. KammerTon. Boston Baroque, Martin Pearlman. Telarc. Le Concert Spirituel, Hervé Niquet. Glossa. L'Assemblée des Honnestes Curieux. Zig-Zag Territoires. Sonnerie (dir. Monica Huggett). Avie. Lynne Dawson (soprano); John Mark Ainsley (tenor); Alastair Miles (bass); William Sharp (baritone); Handel & Haydn Society; Christopher Hogwood. Arabesque. Endnote: A complete live recording of Jephtha (conducted by Nicholas McGegan and featuring John Mark Ainsley, Dominique Labelle, The English Concert, and Winchester Cathedral Choir) was not eligible for consideration because it is only available to members of the Göttinger Händel Gesellschaft (Göttingen Handel Society).